There is nothing quite like spending Christmas in the mountains. The air is cooler and the chance of snow is greater. Not to mention, it does not take nearly as much effort to make your home really feel like the cozy holiday season. Natural Christmas decorations can be gathered from your backdoor with ease – mix the evergreen, with the twigs, pinecones, and a few flowers and your Christmas decorations are done! Using only white lights continues the natural Christmas décor theme perfectly. Red wired ribbons and artificial red berries are also decorating items you can pull out of the closet season after season. This Christmas, sneak away with your family and leave the fussy holiday décor behind. At Southern Living we are always embracing the easy simplicity of holiday decorating and these natural Christmas decorations will surely inspire. Spend your Christmas in the mountains, or bring a bit of mountain nature in to your home with these natural Christmas decoration ideas. Curl up by the Christmas tree and roaring fire and let it snow, let it snow, let it snow! On a visit to the North Carolina mountains not long ago, we found the perfect location for a wonderful holiday decorating story as well as a seriously talented team that could create it. With interior designers Molly Northern and Darlene Parker, we visited the Sunalei Preserve (pronounced soo-nah-lee), a residential community situated on a majestic mountaintop near Boone. Molly and Darlene showed us through one of their favorite interior design projects, a handsome Adirondack-style lodge built of native stone, bark siding, and hand-hewn timbers that's known as the Main Camp. When the designers mentioned their plans to return to the Main Camp and decorate it for Christmas, we knew that we'd found quite a special story. You can easily re-create Molly and Darlene's ideas using a variety of evergreen plant materials, such as boxwood, fir, pine, holly, and nandina. Clip some greenery from your garden or purchase it at a tree lot, and let's get started. HOLIDAY HINT: Set your kitchen aglow with sparkly tree lights. Wrap a strand around a length of garland and swag it across the windows. One-of-a-kind log mantels and rustic doors--many created by carpenters using materials found in the woods nearby--make a perfect backdrop for Molly and Darlene's all-natural decorations for the Main Camp. To get a head start decorating the deep porch and several large rooms, they purchased ready-made wreaths and lengths of garland. Then they attached pinecones and other materials using wire. 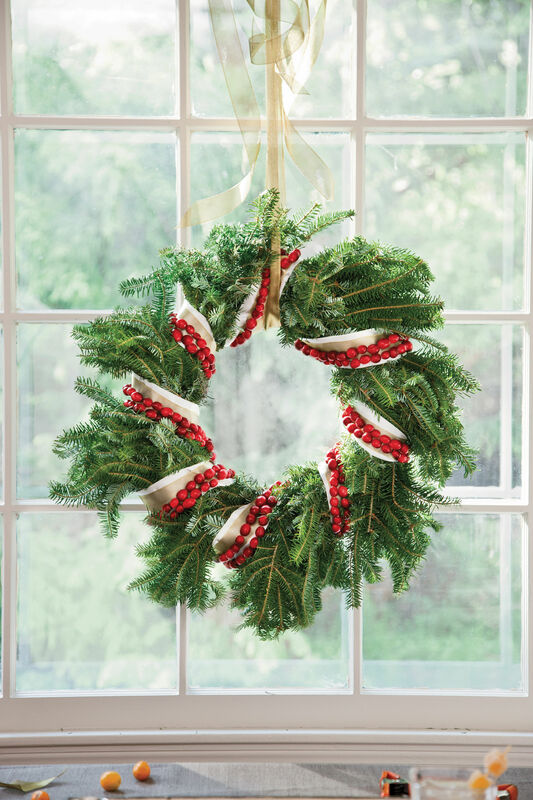 For the front door, they created a fuller wreath by wiring a boxwood wreath onto a fir one. Tartan ribbon and strips of plaid fabric add sparks of red. The designers surrounded the front entrance with boxwood garland; twisted lengths of the same material adorn the gabled timbers of the porch. The welcoming interior is a marvel of exposed wood and natural stone. Darlene and Molly furnished it with comfortable seating upholstered in beautiful leathers and tapestry-like fabrics. Homeowners at Sunalei Preserve enjoy gathering in front of the fireplace in the library. To give a lush look to the mantel decorations, Molly and Darlene combined twigs and layers of greenery, including boxwood, spruce, cedar, and pine. Small lamps add a cheery glow, and a bow-trimmed cluster of greenery hangs just above the old landscape painting on the mantel. The designers dressed up the Christmas tree with pinecones, bird's nest ornaments, clusters of nandina berries, and strands of white lights. By inserting plenty of twigs into the crown of the tree, they made it look a good bit taller. Fashion your own ornamental bird's nests by twisting clumps of Spanish moss or finely curled wood shavings into circles and adding a few candy eggs. To create containers for the large coffee table arrangements, Molly used wood screws to join three sizable pieces of poplar bark. Glass cylinder vases filled with long twigs and pieces of greenery fit inside. HOLIDAY HINT: Accent a coffee or dining room table with a tall arrangement of pine boughs, fir branches, long twigs, and berries. For several years, Sunalei's developers, Mary Jane and John Rice, collected pieces of antique sporting equipment. Their discoveries--items such as handmade snowshoes, wicker fishing creels, painted croquet sets, old skis, and wooden canoe paddles--find places of honor in each room. With a few clippings of pine or cedar, Darlene and Molly gave these old treasures a touch of holiday flair. HOLIDAY HINT: If you remove any branches from your tree to make it fit the stand, wire them together and then add a bow and pinecones to duplicate this look. The duo accented the dining table with a whimsical collection of porcelain elf vases and candy dishes, greenery, and desserts. And they didn't forget to cook up a little holiday cheer in the kitchen. They fashioned a holiday window treatment by twisting tiny white lights around evergreen garland and draping it above the window. HOLIDAY HINT: Use quaint collectibles when setting your table. The designers filled nostalgic elf vases and figurines with an enticing array of candy and other goodies. "Warm Welcome" is from the December 2007 issue of Southern Living.